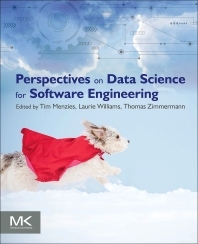 Perspectives on Data Science for Software Engineering presents the best practices of seasoned data miners in software engineering. The idea for this book was created during the 2014 conference at Dagstuhl, an invitation-only gathering of leading computer scientists who meet to identify and discuss cutting-edge informatics topics. At the 2014 conference, the concept of how to transfer the knowledge of experts from seasoned software engineers and data scientists to newcomers in the field highlighted many discussions. While there are many books covering data mining and software engineering basics, they present only the fundamentals and lack the perspective that comes from real-world experience. This book offers unique insights into the wisdom of the community’s leaders gathered to share hard-won lessons from the trenches. Ideas are presented in digestible chapters designed to be applicable across many domains. Topics included cover data collection, data sharing, data mining, and how to utilize these techniques in successful software projects. Newcomers to software engineering data science will learn the tips and tricks of the trade, while more experienced data scientists will benefit from war stories that show what traps to avoid. Software engineering data scientists; may be of interest to students in a graduate seminar. Can We Minimize the USB Driver Test Suite? How to Measure Individual Productivity? Another Use of Stack Traces? Tools! Tools! We need tools! Which machine learning method do you need? Do additional Data Arrive Over Time? Are Changes Likely to Happen Over Time? If You Have a Prediction Problem, What Do You Really Need to Predict? Do You Have a Prediction Problem Where Unlabeled Data are Abundant and Labeled Data are Expensive? Do You Need to Use Data From Different Sources? Do You Have Little Data? What Does Data From Empirical Studies Look Like? How Far Can We Use the Outcomes From Systematic Review to Make Decisions? So… How is That Related to Predictive Modeling for Software Engineering? Prologue: We Have Solid Empirical Evidence! Conclusion: The Truth is Out There! Do Bug Reports Describe Code Defects? Do Developers Apply Atomic Changes? Are We Actually Helping Developers? What Would You Say… I Should DO? So What Should Researchers Do? So What Should Practitioners Do? What Is Diversity and Representativeness? Which Features Should I Look At? Data science revolution in process improvement and assessment? What to Do About the Dearth of Data? What to Do on a Tight Budget? What can go wrong in software engineering experiments? How Do We Compare a USB2 Driver to a USB3 Driver? How to Act on (Anti-)Patterns? Build It and They Will Come, but Should We? Laurie Williams, Full Professor and Associate Department Head CS, NC State. 180+ publications, many applying software analytics. She is on the editorial boards of IEEE Trans on SE; (2) Information and Software Technology; and (3) IEEE Software.